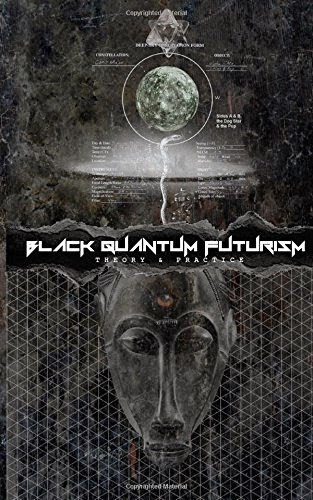 Rasheedah Philips opens the collection with “Constructing a Theory of Practice of Black Quantum Futurism, Part One.” This introductory essay gives the reader some sense of meaning and direction for the overarching concepts of Black Quantum Futurism (BQF). She describes many of the concepts, the difference between future visioning and future altering for instance, seem, with such simplicity and clarity, that a reader may forget how strange and unusual the topic actually is. She speaks of the practitioners of this theory as BQF Creatives, who work to “subvert the strict hierarchical characteristic of linear time” (12). What comes through most meaningfully is the powerful idea that there is more than one way to think about time. In western cultures, we have adopted a linear mode of time, where the past affects the present, the present affects the future, and that is that. Here, we see a very carefully crafted counterargument that looks at time not linearly, but sometimes cyclically, sometimes in pairings or patterns or probabilities. In Dr. Imani’s essay, he appears very critical of science and math for focusing on western perspectives and philosophies when African thought, especially, the Swahili understanding of time, has much to offer such disciplines. He opens by explaining the role and purpose of Africana studies, which is not simply the study of African culture or people, but the study from an African perspective, which immediately begs the question, where else, what other fields, disciplines and topics, could benefit from such an approach? He makes the case that quantum physics, which grapples with the most baffling of spacetime mysteries, could be greatly enriched if someone were to consider Swahili concepts of Zamani and Sasa, or macrotime and microtime. Later in the collection, other ideas are added to the mix. “Odd futures: How Hiphop Defined Post-Modernism,” by C. Longmire, makes a particularly interesting comparison between postmodernism in visual art and postmodernism in music, demonstrating the role and creativity of DJing and turnstyle techniques to challenge and push the boundaries of art. I found this essay to be particularly informative, easy to read and packed with humor. This essay also fit with the collection as the author connects the African perspective to postmodern aesthetic. The contributors to this collection have many impressive credentials, especially, Dr. Nikitah Okembe-Ra Imani, who makes the most progress toward illuminating the audience about this intriguing project. Dr. Imani has a PhD in Sociology as well as two master’s degrees. Rasheeda Phillips, the force behind the project, is a practicing lawyer and advocate, as well as a writer. What is noticeably missing is an author with a physics background. The presence of such a contributor would certainly give credibility to the more abstract claims being made, but I think could also have added a richness to the discussion. What I think is most interesting about this book is the intersection of the hard sciences and the unique and longstanding perspective of the Swahili, or other nonwestern people. Someone with hard skills in physics could have added a level of depth and detail that would have greatly increased the resonance of that narrative. Readers more interested in futurism or in the unusual collection of Black perspectives won’t have that disappointment. This book may in fact be written for an audience already aware of futurism and its traditions. As a newcomer, I felt that there was a much larger conversation going on and I wasn’t getting the whole picture. The collection, at 84 pages, is so short that I wonder why it is released in two volumes. I also have to wonder if it was rushed into publication. Typographical errors occur so frequently, they become a distraction. At one point, an entire sentence is repeated. More often, sentences are interrupted with commas or misspellings that are likely to trip up the reader who is struggling with challenging and abstract ideas. After reading this volume, I’m not sure what this collection is trying to accomplish. The first several essays, which in fact are the hardiest in terms of depth and complexity, grapple directly with challenging ideas of time and space. The authors delight the science fiction reader with spectacular ideas when viewing quantum physics from an African tradition. Later, shorter essays seem to go off topic. One essay looks at the current plight of African Americans, quite forcefully expressing the need for drastic changes. Another looks at money and the challenges communities face because of it. The two essays both discuss changing the future, but calling that a connection feels like a stretch. The essays on their own make cogent arguments, but the collection seems far from cohesive. I can’t say that the book answered all my questions, but I think that it is doing something very important for both the progression of science and equality of non-western perspectives. The idea that African cultures and traditions, that any non-western tradition, has an approach or a system of thought that could elevate and help navigate through the complicated halls of modern science could be the next scientific frontier. Science fiction fans should make their way through the collection just for the chance to be inundated with such innovative ideas of the genre. Thank you very much for your review on the book! We are happy to have our first review on it. Your thoughts and criticisms are well-taken. Just a note that it was put out quickly and was self-edited. It is really a cross between a zine, manifesto, and book, and this was sort of done as a means of challenging what traditional books, academic texts, and compiled bodies of knowledge look like. The Volume I aspect is somewhat tongue in cheek. As the essay that is the title of the book was originally written on its own as a manifesto exploring my personal futurism theory, I wanted to publish it as it was but also wanted other concrete perspectives and practical views on the rather abstract notion of world-building, consciousness shifting, world destroying, etc. So these essays were not all written at the same time, and the writers were not prompted to write particularly about Black Quantum Futurism, but about some aspect of speculative and metaphysical thought or practice that could be explored using practical tools, terminology, etc. There was personal urgency around releasing the project because the topics are extremely critical to things that are occurring in my community right now, and also other projects that we have in conjunction with the book. I thought it would be interesting to juxtapose these visions and find parallels and connections. I guess the cohesion that I see is that they are all experimental, visionary essays dealing with afrofuturism, speculative science, or some futurist territory. Thank you again for reading, for your thoughts, and general support for the explorations being made in the book.